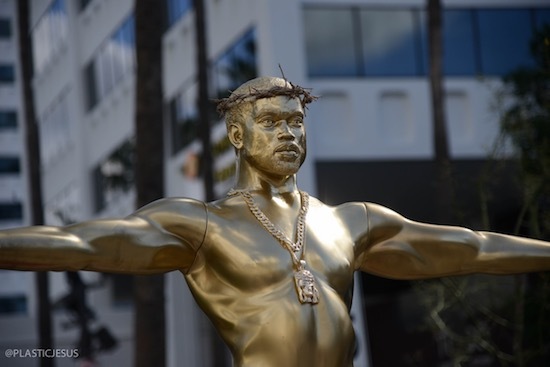 Notorious Los Angeles Street Artist Plastic Jesus has again caused Academy Award controversy by placing a life size Oscar statue on Hollywood Blvd. 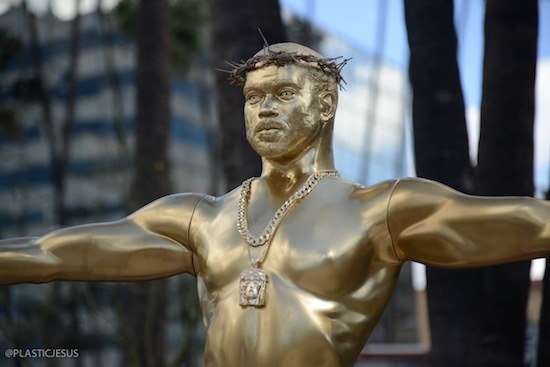 Unlike the official faceless gold figurines, this one is a likeness of Kanye West — and is entitled “False Idol”! 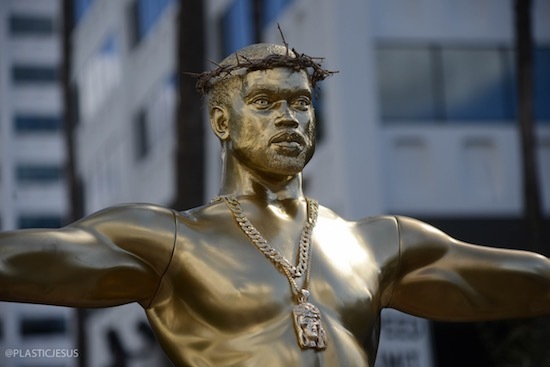 The Kanye likeness features tightly cropped hair, neck chains, and is wearing a pair of Yeezy shoes. 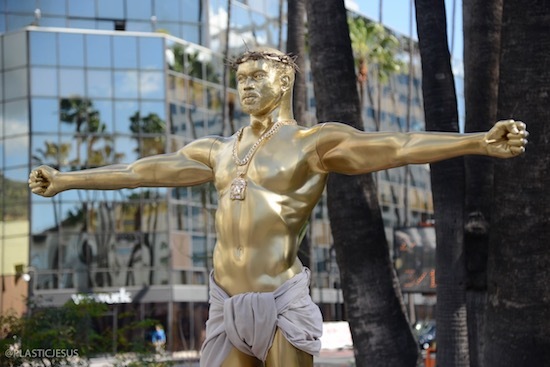 In previous years the British born guerrilla artist has created a cocaine snorting Oscar statue, a gold plated stripper on a pole, and a heroin injecting figure following the drug-related death of actor Philip Seymour Hoffman. 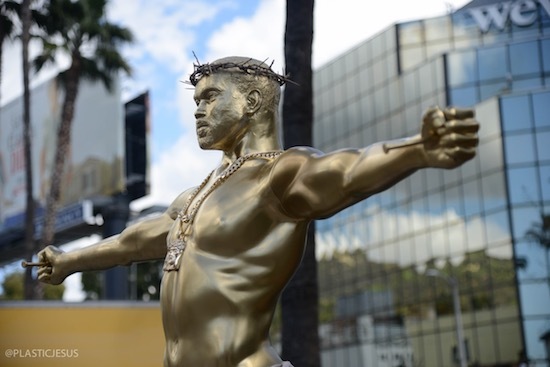 The artist claims his street installations are to highlight issues which are going unnoticed in the glitzy world of Hollywood. 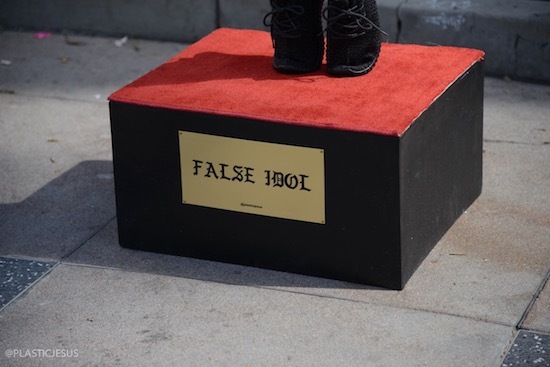 The installation appeared on the famous Boulevard on Wednesday morning, closely guarded by two burly security guards. Plastic Jesus had the custom figure moulded from resin specially for this year’s event by a Los Angeles based mannequin company. 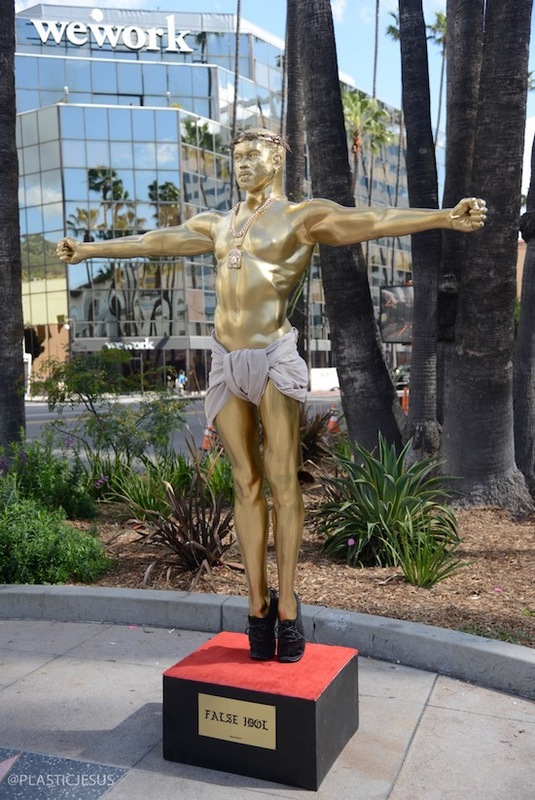 For this year’s Oscar installation, Plastic Jesus collaborated with another “Ginger” — the sculptor who created the naked Donald Trump figures that appeared on the streets at the end of 2016. Ginger spent four weeks carefully crafting the head and then moulding the final piece to produce an amazing likeness of the rapper. 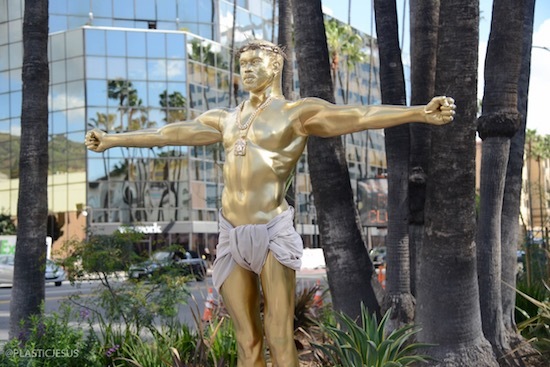 The life size figure took about 6 weeks to produce in total but will only be on Hollywood Blvd for one day. If fans wish to see the statue in person they can see it at Plastic Jesus’ forthcoming show — Anesthesia – The Art of Oblivion — on Feb 25th at Gibson headquarters located at the former Tower Records store at 8801 Sunset Blvd in Los Angeles. 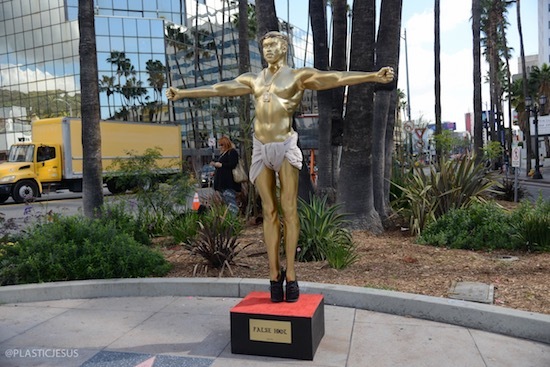 Hosts Nicole Powers and Bradley, Kylie and Wolf Suicide are joined by Plastic Jesus, who tells the ladies about his new Kanye West-inspired “Oscar” installation on Hollywood Blvd and his upcoming Sunset Strip show with collaborator Billy Morrison entitled Anesthesia – The Art of Oblivion.